Prepare the bottom of a 10x13 pan with cooking spray. Preheat oven to 325. Melt butter over medium-low heat. Add garlic and cook for about 30 seconds, or until fragrant. Add heavy cream. Keep heat on medium-low, stirring frequently, until lightly bubbling. Slowly add cheese while stirring. Turn heat down a bit and continue to cook until desired thickness is reached. Boil your noodles until they are about 1/2 to 2/3 done, and then drain well and rinse in cold water. To prepare the spinach layer, thaw and drain your frozen spinach well. I like to use a fine mesh strainer and really squeeze allllll the liquid out that I can. Once it is well-drained, place it into a medium saute pan with the butter, cream, nutmeg, salt, and garlic. Simmer over medium heat, stirring frequently, for 3-4 minutes. Remove from heat and set aside. In a separate bowl, combine the cottage cheese, ricotta, parmesan, egg, and seasonings. Mix until well combined. Layer the ingredients in the pan in this order: noodles, 1/2 of cottage cheese mixture, all of the spinach mixture, 1/3 of the mozzarella cheese, 1/3 of the sauce, noodles, other half of cottage cheese mixture, 1/3 of mozzarella cheese, 1/3 of the sauce mixture, noodles, the rest of the sauce, the rest of the mozzarella cheese. Bake lasagna, covered, for 30-40 minutes. Remove the cover during the last 15 minutes of cooking to allow for a slight browning of the top layer. Remove from oven and let sit for 15 minutes before cutting. While the lasagna is resting, liberally season the chicken with the salt, pepper, garlic salt, and onion powder. Place the olive oil in a large skillet, and heat over medium- low heat. Cook slowly over medium-low heat until no pink remains. 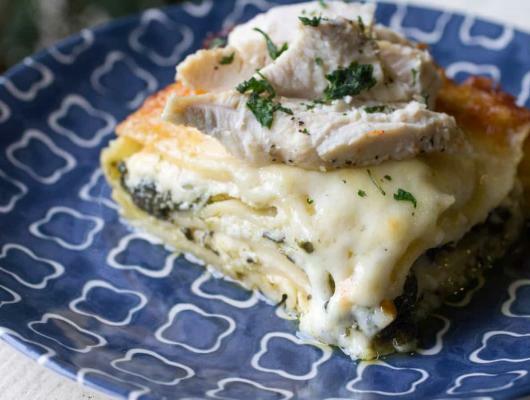 Serve chicken on top of the individual pieces of lasagna. 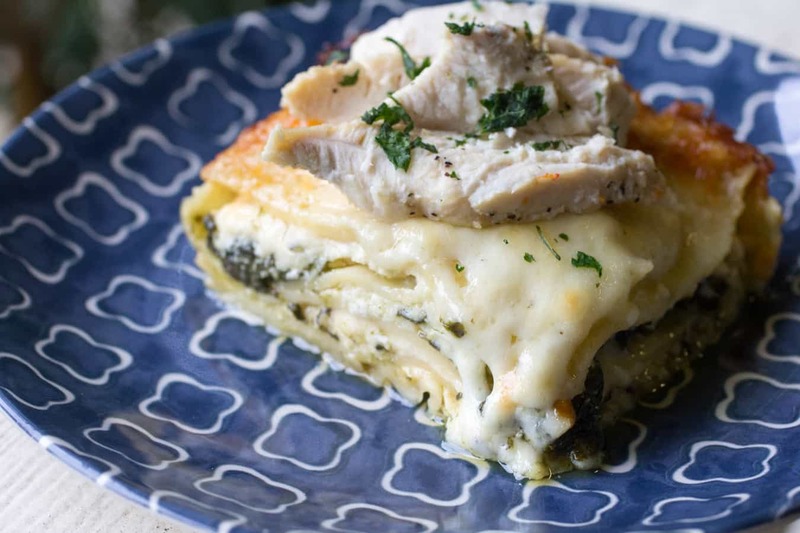 Chicken Alfredo Lasagna with Spinach is a great change-up to a traditional lasagna. Filled with cheese, a creamy alfredo, and topped with tender chicken breast strips. Check out my blog post here!